Socialising, getting to know each other. you know anything about the last year late hatched storklet? about its season end? Yes, someone has been watching and informing me. It was fledging and I hope it has arrived well in its winter area! Yes, someone has been watching and informing me. 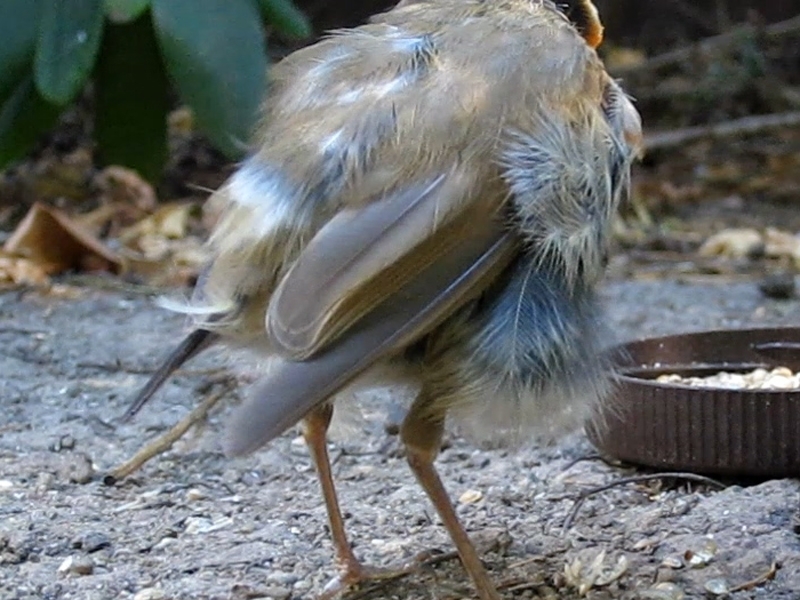 It was fledgling and I hope it has arrived well in its winter area! Oh, very nice photos/shots, Liz . Beautiful stork family. 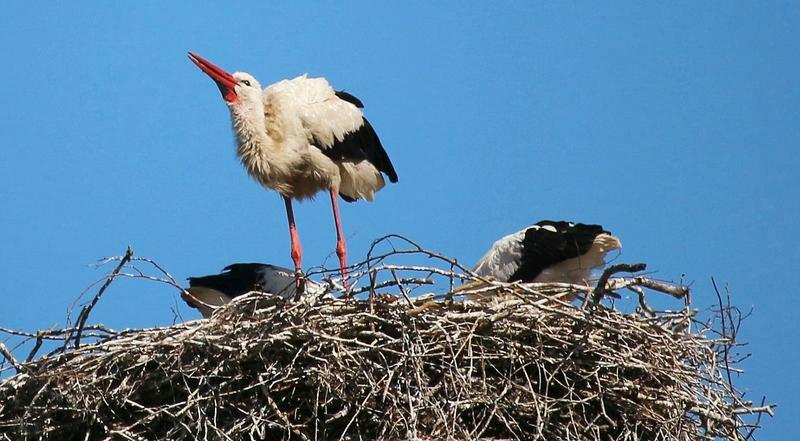 I am surprised that the nest is near Berlin (we have no storks around Prague I think). Thanks for sharing with us. I remember that you wrote last year about the late hatched storklet from there. The nest is in Waßmannsdorf. A small village near Berlin. 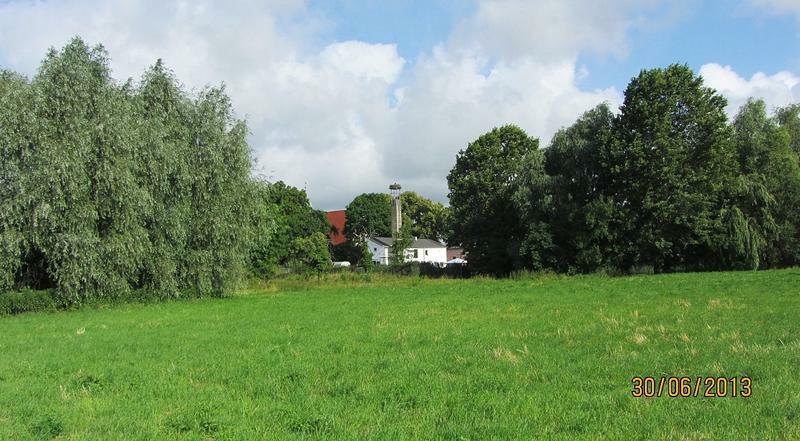 I live I on the southern outskirts of Berlin. I see buzzard, red kite, goshhawk, heron, kestrels and much more. You just have to keep your eyes open. Buzzard and herons breed where I live. It is a small forest area. Berlin is a green town. still! Too many people are coming and want to live here. For this nature is destroyed. This is a pity. Liz wrote: The nest is in Waßmannsdorf. A small village near Berlin. I live I on the southern outskirts of Berlin. I see buzzard, red kite, goshhawk, heron, kestrels and much more. You just have to keep your eyes open. Buzzard and herons breed where I live. It is a small forest area. Berlin is a green town. still! Too many people are coming and want to live here. For this nature is destroyed. This is a pity. 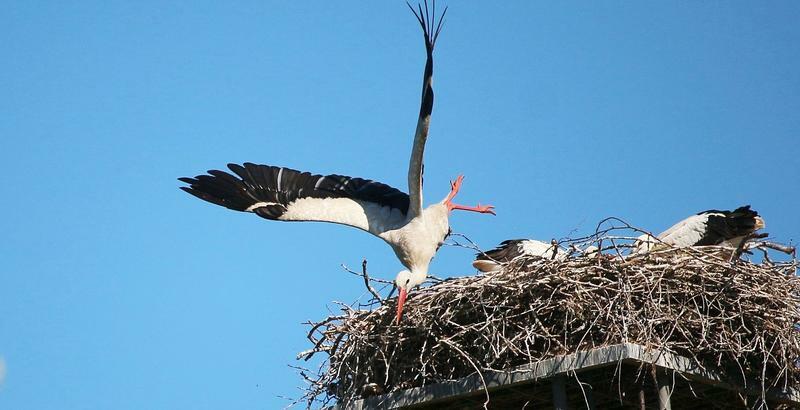 These are also very nice shots of moving storks and the place with the nest is really picturesque . ... So you must have a very pleasant place for living ... I live in Prague - but at least very close to a large park with many birds (mostly water birds). 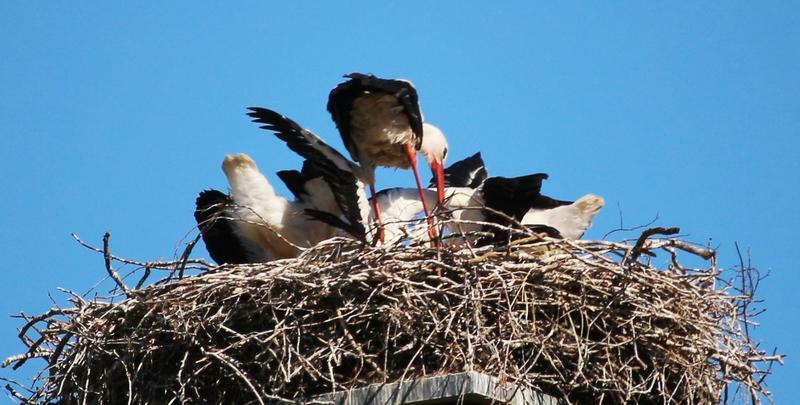 However storks are not closer than 40-50 km from here. Is that true that bread is harmful for all the birds? All those birds in the parks look very healthy and like white bread so much. They don't eat only bread, it is like cakes and sweets for people. Wow! Never saw this or heard of it before. 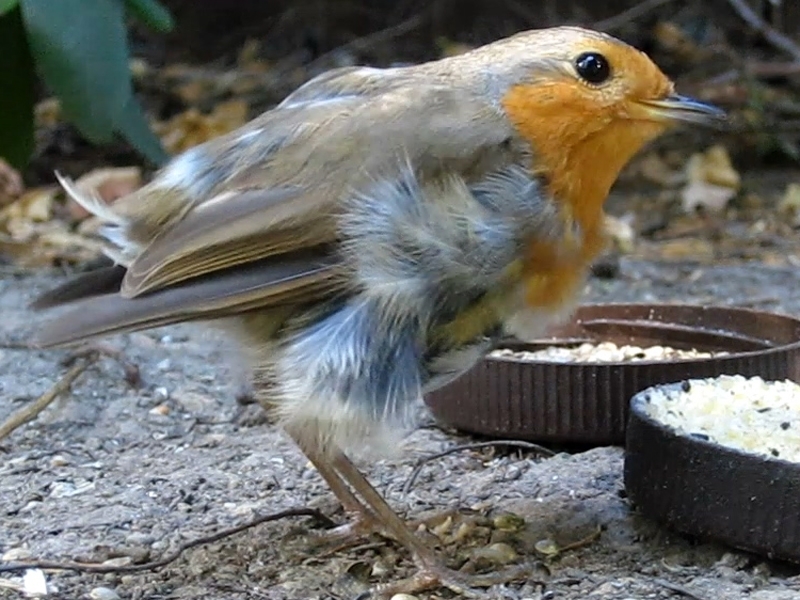 The robin in my garden prepares for a carnival ball. I would say: Yes, that is true. If it was only one newspaper article which asserts that it's bad for birds, that would be no cause for concern. But there are many articles about this problem every year. And nature / bird organisations frequently point to this fact, too. White bread has no nutritive value, it's not very healthy for us, too. Look at all the dogs running around and being fed with bread and cake, they are fat, have respiration problems and cardiac insufficiency. 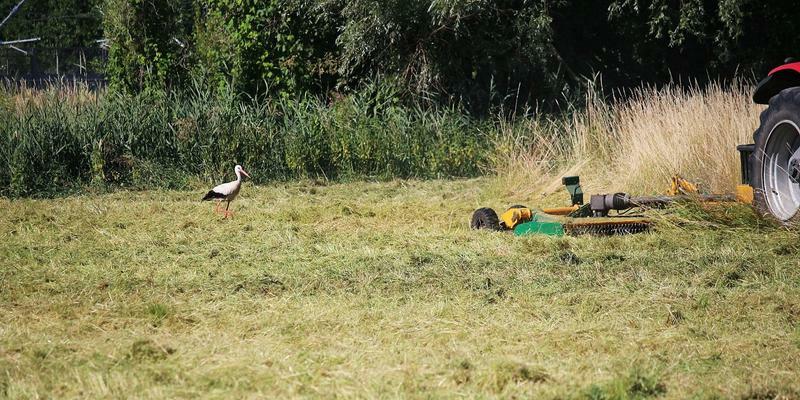 I hope, that he/she was able to fly. 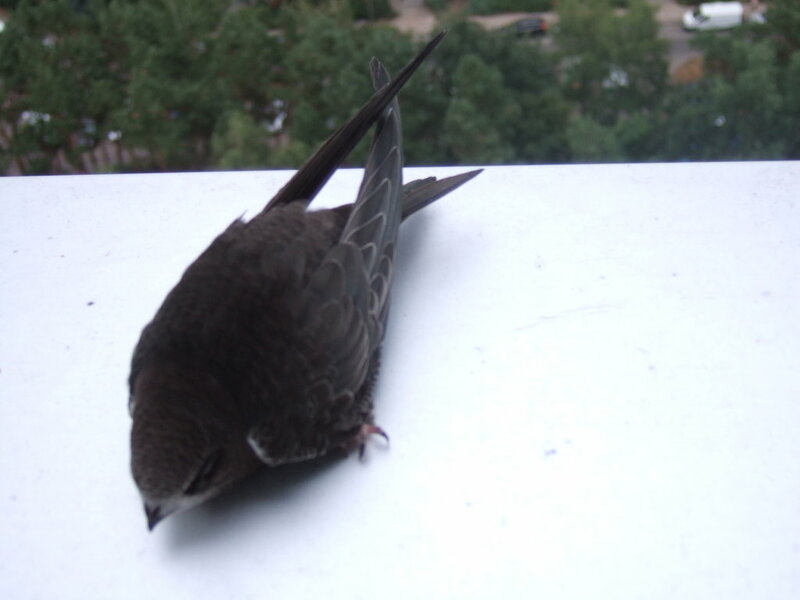 Two years ago I found also a little eurasian swift, I brought it to a woman, which was able to feed swifts (it's not easy for sure). The little guy is grown very nice. Three weeks later we could collect him there. This swift started then to fly from my hand. It was an amazing moment. It is not that simple with ducks. Sometimes they ignore bread at all and sometimes are very hungry and eat it. And when they are hungry, each duck gets only a very small piece of bread(if any), because there are very many of them(about 40 and then their number increases to 100). Bread clearly is an addition to their main food, exactly like sweets for people. On the small pond there are a few ducks, but I don't feed them anymore because usually people with dogs come there and dogs scare those ducks and ducklings when they are too close to the bank of the pond. So better not to teach them to go out, let them hide among the plants.